A transcript is the official record of your academic achievement at Cal State East Bay. You may order copies of transcripts to send to yourself or other educational institutions, employers, or agencies. Official transcipts are sealed and printe on our specialty school transcript paper. Unofficial transcripts are not sealed and are printed on regular white printing paper. The fee for the first official transcript is $4.00. The fee for additional official transcripts prepared at the same time is $2.00 each for up to ten transcripts. A surcharge is also assessed on all online orders. Unofficial transcripts are $2.00. Official transcripts may be ordered online and paid by credit card. You may request a printed transcript to be sent via regular mail, or sent by FedEx overnight shpping for an additonal charge. For most students who began attendance after 1995, official transcripts may also be electronically delivered via the NEW PDF method. PDF - electronic transcripts are processed almost immediately after the order is submitted along with any required documentation. For detailed instructions regarding this new PDF method, see our handout on How to Order a PDF Transcript. There are two ways to order an official transcript online. Current Students with MyCSUEB Access: Log in to MyCSUEB using your Net ID and password, and select “Order a Transcript.” This will direct you to a third party service, Credentials, Inc. 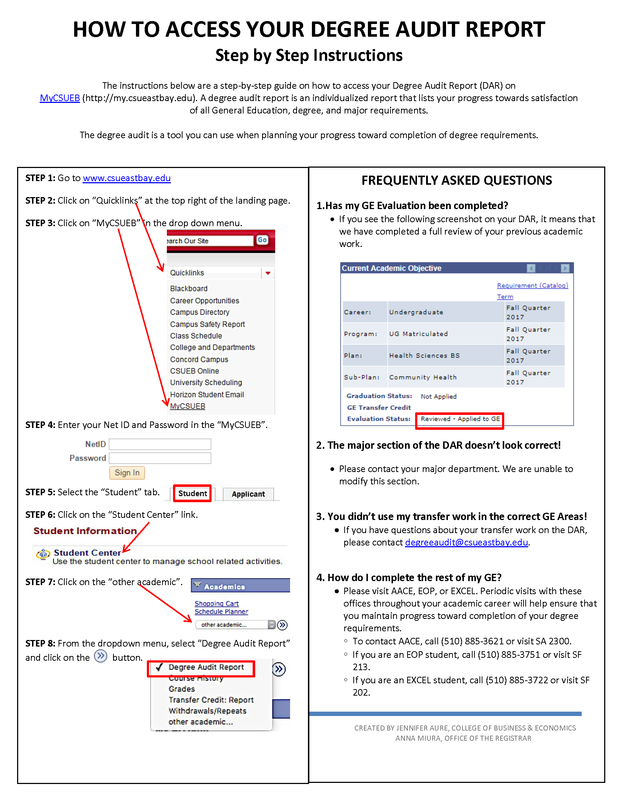 The status of online transcript orders can be checked in your MyCSUEB student account. Alumni or Students with a deactivated Student Account: Order directly from Credentials, Inc.
Orders placed directly with Credentials, Inc. require a written signature authorization by fax or mail. A NetID is not required to place this order. The status of online trancript orders can be checked directly with Credentials, Inc. If you have a NetID and password, students who have attended after Fall 2001 can view and print an unofficial transcript at any time through MyCSUEB. Students who attended prior to Fall 2001 will not be able to view their transcript online, but may order an unofficial by submitting the Transcript Request Form in-person or by mail. Students with financial holds are not permitted to receive or order transcripts. To find out how to remove a hold, see more information under hold in How to Register for Classes. Students who wish to have a diploma or transcript notarized for the purpose of foreign embassy and consulates, can re-order their diploma or official transcript and take the documents to any public notary for notarization. Students can use any public notary of their choosing, and are responsible for scheduling the notarization and payment with the notary.